On this day before Thanksgiving, I wanted to share a fun & festive project to keep little hands busy and to brighten up the decorations for your feast 🙂 It’s a wonderful sensory activity too working with feathers and glue! 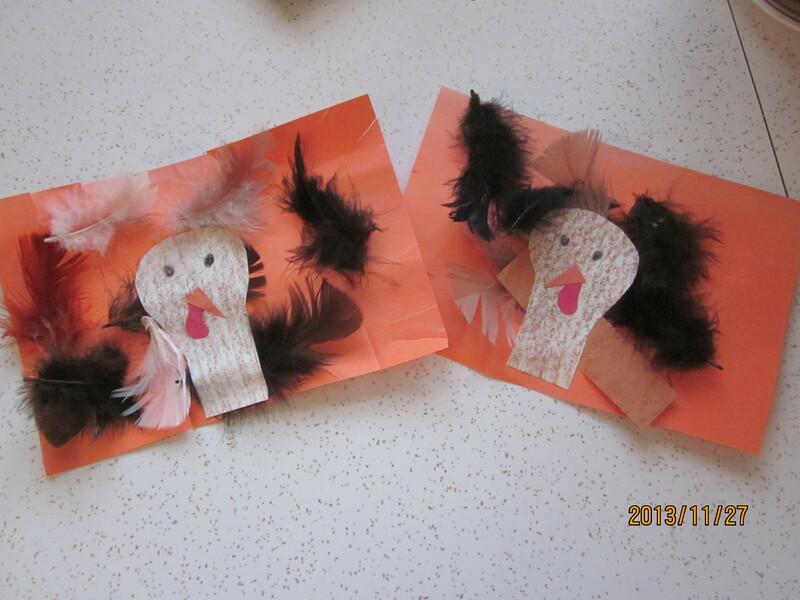 Both of my children (3 and 1) worked hard and were able to make a turkey of their own. For my son who’s 3 I let him use his own glue stick to glue feathers to a piece of orange construction paper. For my daughter who’s 1 and a half I spread the glue on the paper and let her stick the feathers on. I cut out brown turkey heads, orange beaks, and red snoods (the skin that hangs from a turkey’s neck). I let my son glue his face onto the turkey head. I did this step for my daughter. Then I glued the heads over the feathers with white glue. We drew on black eyes. I think they turned out pretty cute! Today is the second day of the Holiday Blog Hop, so hop on over to You Know What Mama… for a list of resources on the history of the Pilgrims. It promises to be an engaging week of Thanksgiving posts. Alice in Wonderland snuggled up with the whole family. Game night with my sisters and brothers-in-law. This week has been harried and long, but it is coming to a cozy, cold, & white end! My husband worked all hours of all days (it seemed). I set up a play room in the basement and reclaimed my living room for adults! We wrote out a list of family rules and set out to stick with them (all of us). I reworked our rhythm to fit the winter darkness and my daughter’s constantly changing abilities and needs. My daughter (1) had another week of fitful sleep. I do not know what it is with her, but she doesn’t sleep predictably. I find this really trying most of the time. But, my oh my she is a sweet girl! She has really taken to playing dress up and taking care of babies. She’s developed some killer dance moves too. She really knows how to get down. My son (3) LOVES preschool and is really taken with many of his new friends. I hear lots of stories about these children 🙂 He has really been struggling with listening lately. 3 is definitely a frustrating age! It’s the tug-of-war between independence and needing/wanting help. And oh how he tests his boundaries. He seems to be doing better with firmer rules and stricter follow through from both my husband and I.
I am busy trying to keep my house livable. I am working on finding my rhythm with house work again. It seems to have slipped over the past month or so. I am also knitting like crazy in every spare moment. With Thanksgiving right around the corner, I am dreaming of gravy and sweet potatoes and Christmas carols! 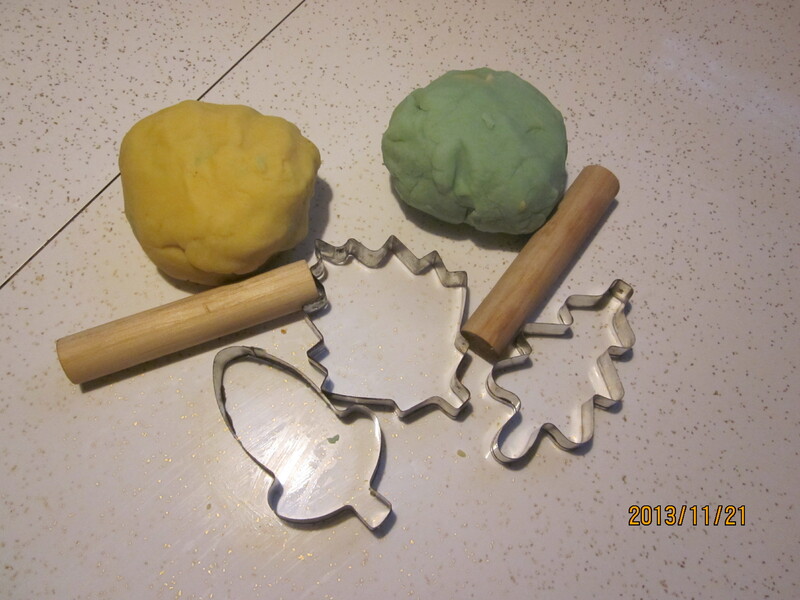 This week’s sensory activity was play dough. My son (3) helped me measure the ingredients. And then he and his sister (1) played! I gave them long wooden cylinders from the block basket and a few leaf-shaped cookie cutters for fall. They had a blast squishing and rolling and cutting. Mix all of the ingredients together in a pan and cook over medium heat stirring constantly until the dough thickens enough to form a ball. Dump onto the counter and knead (when it’s cool). It should keep for a week in an airtight container. If you don’t already make a point of giving your children a variety of sensory activities, I highly recommend it. Not only are they wonderful learning experiences, they are often calming and incredibly engaging for children. Best of all for us parents, they keep them busy and quiet for longer than you might think. This holiday season I am participating in a blog hop! Please enjoy posts all season long from fellow bloggers sharing their experiences and tips for celebrating. It’s the 1st day of our Holiday Blog Hop! And with Hanukkah just around the corner (next week) we begin with a beautifully informative post about the Festival of Lights by Lavender’s Blue Homeschool. It is full of history and background for those of us not familiar with the Jewish celebration. You will also find plenty of ideas and resources to include in your own family’s winter festivities. Happy Hanukkah!